I am young programmer(ish?) from Brno, Czech Republic. My real name is Vojtěch Boček, and somebody else with no activity whatsoever has chosen same nickname as I did, Tassadar. Other than that, normal geek-ish person - playing Diablo 3, reading A Song of Ice and Fire, pale skin, very little social skills, you know it. Lorris is Qt app designed to be used when doing something with microcontrollers, like a toolbox or something. Example: you have robot with color sensor. You need to show data from that sensor somewhere. Lorris is that somewhere. That was the simplest example. It can do much, much more. See the slightly outdated homapage for details. It can boot any Android ROM as well as other systems like Ubuntu Touch, once they are ported to that device. The main part of MultiROM is a boot manager, which appears every time your device starts and lets you choose ROM to boot. ROMs are installed and managed via modified TWRP recovery. You can use standard ZIP files to install secondary Android ROMs and MultiROM even has its own installer system, which can be used to ship other Linux-based systems. Small C library to deal with Android's boot images. Contains also cli program bbootimg, which is abootimg-compatible interface to libbootimg. I needed a library to unpack/pack/update boot images in MultiROM, so I wrote one. Small & simple joystick library written in C for Linux and Windows. I've created it to get rid of SDL from Lorris, because I was using like 5% of that huge library, and it seemed kinda useless to drag it around, especially on Windows. See READMEmd. 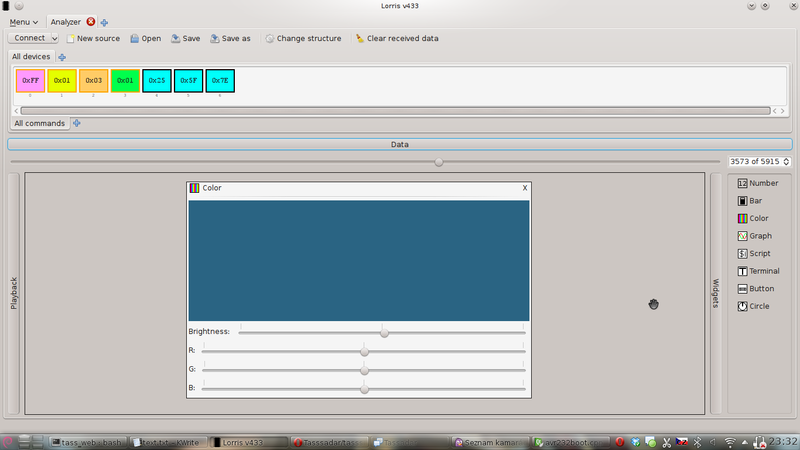 Updater app for Lorris, written in C++ and it is using WinAPI only, so that it can be as small as possible. It will just check Lorris' version, download ZIP file and extract it. Small, simple. Bashoid is Audio's project and I just made several addons. It is an IRC bot, written in java and it's main advantage is addon-like structure. Program for 3pi robot (eg. ATmega328P chip), which acts like RC car. It also shows some info on built-in display. More info in README. Library for 3pi robot compiled together mostly from their libpololu and avakar's Yunimin library. It is designed to be used as single header file, just include "3piLibPack.h" and that is all. Supports motor control, display, RS232, buzzer and more. There is a wiki available.